The Ramones' first three albums are indispensable artefacts of the late-seventies punk explosion with their venomous fusion of Alice Cooper, The Lemon Pipers and any other adolescent obsessions and college preoccupations. Ultimately, like their early live shows, these early albums are exhilarating formal triumphs. 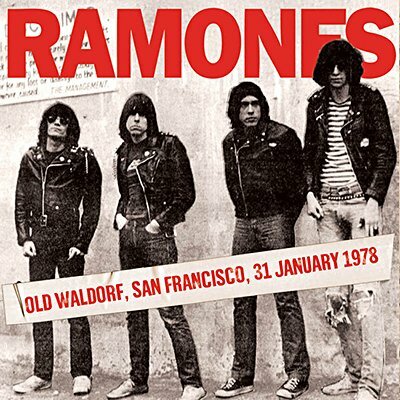 Their 31st January appearance at The Old Waldorf in 1978 enforced this with an abundance of energy and good vibes. Sweating American culture from every pore in twenty-six songs delivered with breakneck ferocity. Quite simply, it was a furore that challenged the pomp of prog and rock drawing on three albums with Rocket To Russia being the most recent. Their Waldorf appearance displays a formidable force of nature in action. Armed with guitars, drums and with the trademark '1,2,3,4..' assault, the band rip through their 1978 setlist, a near carbon copy of their more familiar January 7th NYC performance aired on the King Biscuit Flower Hour. Incidentally, Tommy Ramone would leave the band shortly after these shows to make way for ex-Voidoids drummer Marc Bell (aka Marky Ramone) to concentrate on producing. Fortunately, the records remain, but importantly, so do a handful of live recordings that can at least allow an appreciation of an equally vital part of their legacy. Echoes proudly presents a rare opportunity to capture The Ramones at their explosive best and in their formative years when CBGB's was a minor backstreet haunt. Their appearance at The Old Waldorf on 31st January 1978, broadcast on KSAN-FM, personifies the energy and ferocity of the band as a live act and assists in securing their legacy not only as an iconic rock 'n' roll group, but also as the last true garage band.